One of the most important considerations in the County budget is the proper funding of our public schools. I am committed to support funding FCPS at a level that will enable them to provide an excellent, top-rate education for our children. The funding for FCPS in this budget ($244 million) will continue to accomplish this. When this amount is added to the $264.7 million from the State and $19.8 million from the feds, it makes a combined annual operating budget of $528.5 million for 40,797 students (approximately $12,954/student). This amount of funding is highly competitive with the amount of funding provided by other counties in Maryland. Funding of the BOE by Frederick County ranks 13 out of 24 jurisdictions—right in the middle. (See Exhibit 1.) While it is true that the salaries for beginning teachers in Frederick County are some of the lowest in the State, the average teachers’ salaries in Frederick County rank 8th in the State (Exhibit 2). Our teachers’ salaries are very competitive, and there are considerable advantages for teachers to live here and to teach in our system. The number of teachers who leave our school system for better paying teacher jobs elsewhere is minimal. Because of the recession and the accompanying drop in property values, there has been a $1 million drop in property tax revenues, compared to those revenues at the end of the previous administration. Property tax revenues are the largest source (52%) of County revenues. Because of this decline, and because of $20 million/year of additional cuts, mandates and taxes that the State has imposed on the County during the last four years, the County has been without sufficient funds to make significant increases in funding for the BOE. While funding of the BOE has remained at the MOE level, the MOE funding has still resulted in a funding increase for FY2015 that is approximately $11 million more than under the prior Board. In addition, the County has given some one-time funding (that does not raise the MOE requirements), plus the County has increased its in-kind funding by approximately $2 million/year. The total of these increases is approximately $13 million a year to the BOE (above the level funded by the prior Board). The County Budget Office constantly reviews and analyzes financial information, including projecting revenues for future years. Because of this, a year ago the Budget Office projected that there would not be funds available to increase funding of the BOE in the FY 2015 Budget. The BOCC therefore notified the BOE of this last year, and advised the BOE that the BOCC proposed to fund FCPS at the MOE level for FY2015, so that the BOE could budget accordingly. Those budget projections have been accurate, and there are no additional monies for increasing anyone’s budget to any significant extent. In spite of this, the FCPS mounted an aggressive campaign to pressure the BOCC to increase their budget by $17 million above the MOE level. FCPS declined to prioritize individual parts of their request; neither did they propose a tax increase to pay for it; neither did they propose what other county programs the BOCC should cut in order to meet their demand. FCPS orchestrated an emotional group of teachers and other supporters, who spoke at the May 6th budget hearing, demanding increased funding for the BOE. For the reasons stated below, I was not able to vote to support the request for increased funding this year. A. 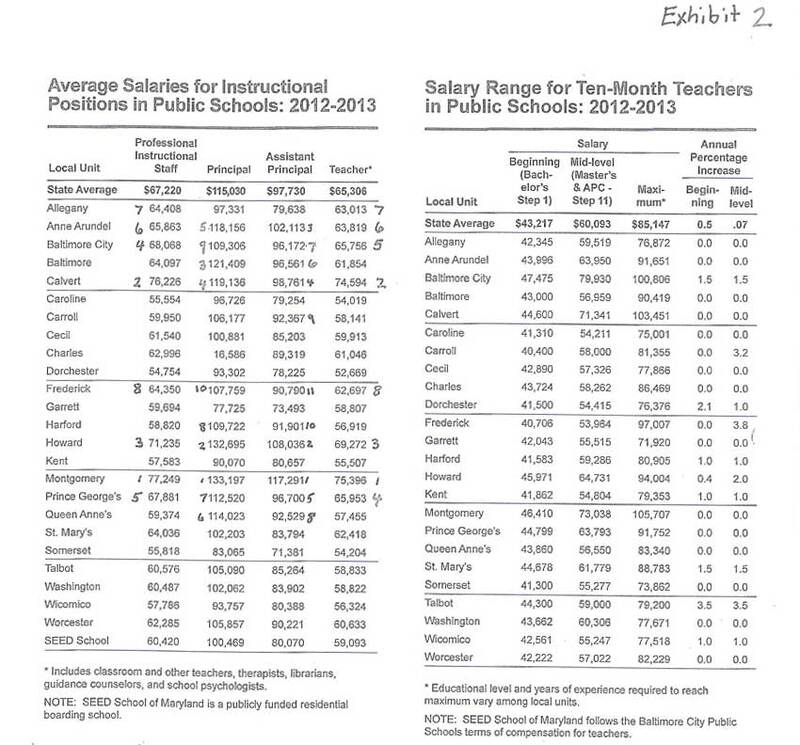 Low Starting Teachers’ Salaries. 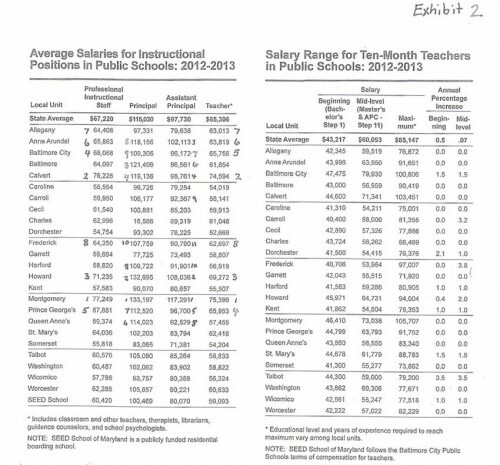 One of the arguments that several people made at the May 6th budget hearing, and which was based upon selective information fed to them by FCPS, was that starting teachers’ salaries in Frederick County are next to lowest in the entire State. Based upon this they argued that the BOCC is ruining the FCPS. This conclusion is wrong, and the reasoning is flawed. Their argument is based upon one true fact (that starting teachers’ salaries in Frederick County are second lowest in the State), but the analysis of this fact has been infected with false assumptions and misrepresentations, which make the ultimate conclusion erroneous. Here are additional facts that were not acknowledged by those who accused the BOCC of ruining the FCPS. The BOCC does not set teachers’ salaries; the BOE does. The BOCC has offered to work with the BOE to adjust their salary schedules, but the BOE does not want any involvement with the BOCC on this issue. The BOE has declined to restructure salaries to increase the pay of starting teachers. The cost of living in Frederick County is lower than the cost of living in some of the counties with higher starting salaries—resulting in greater buying power for the Frederick salaries. The overall average salaries for teachers in Frederick County ranks 8th in the State, which shows that low starting salaries are offset by higher pay increases later. The salaries for principals with Doctorates in Frederick County ranks 8th in the State. The salaries for vice principals with Doctorates in Frederick County ranks 5th in the State. The salaries for psychologists with Doctorates in Frederick County ranks 2nd in the State. Why is it that those people who accused the BOCC or ruining our education system did not mention these above facts at the hearing on May 6th? Apparently they were not aware of these facts. None of these people acknowledged that these facts undermine their arguments. The fact that these facts were not mentioned indicates that those who criticized the BOCC did not do their homework on this issue. Apparently, they merely used the few pieces of information that FCPS furnished them in making their arguments. A full study and evaluation of all the facts shows that Frederick County teachers’ salaries are in the top third in the State and that funding for FCPS teachers continues to be very competitive with other counties in the State. 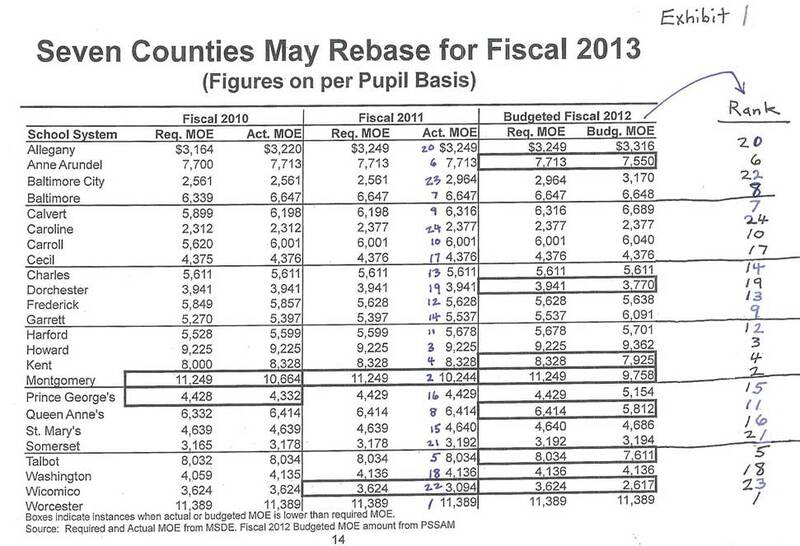 The BOCC is not ruining FCPS by level-funding MOE in FY2015. The funding proposed in this budget is not as much as I would like to give. Nevertheless, a budget of over $1/2 Billion is sufficient to keep our schools among the very best in the State and the nation. B. Level-Funding of Maintenance of Effort (MOE). Another argument made against the BOCC at the May 6th budget hearing was that funding of the BOE at MOE level would ruin our education system. There is no factual support for this assertion. Rather the facts tend to refute it. During the last 14 years, Frederick County has gradually increased the BOE funding in excess of the 2000 MOE level by $67 million/year above the amount required by State law. 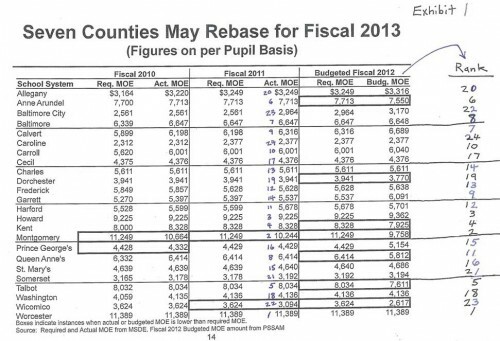 No one who criticized the BOCC on this issue cited any information about what other counties in the state were funding education above the MOE level. The attached chart on Maintenance of Effort funding (Exhibit 3) shows that for FY2013, 11 of the 24 jurisdictions level-funded MOE, and 7 other jurisdictions increased MOE funding by less than 1%. Only 6 jurisdictions increased MOE funding more than 1%. Why is it that no one mentioned this information at the hearing on May 6th? The point is that almost all counties in Maryland continue to have revenue problems that make it difficult for them to increase funding for public schools. For the last four budget cycles almost all counties have had difficulty funding their schools at the MOE level. Most of the counties have joined forces in the Maryland Association of Counties (MACo) to help lobby the State to back off some of the stringent financial requirements of the State MOE law. Consequently there were some changes made in the law, and some counties were allowed to re-calibrate their MOE amounts. In the budget cycles for FY2012 and FY2013, few citizens in Frederick County voiced any complaints about the MOE level of funding that the BOCC proposed and passed in those budgets. But last year and this year, FCPS and the teachers’ union orchestrated demonstrations to complain and protest that MOE funding was not enough. Maintenance of Effort (MOE) level, by definition, is a level of financing that is supposed to keep the quality of education superior. The MOE level is not an inadequate or substandard level—it is a superior, excellent level of funding. Frederick County has established itself as having one of the best school systems in the state, despite level funding of MOE the past three budget cycles. We have every reason to anticipate continued excellence at FCPS this coming year. This does not mean that funding of education should not increase in the future. As property values recover there will be additional revenues to provide more funding. But with the current revenue constraints that are projected for the next couple of years, there are insufficient revenues to increase the BOE budget now. Only a few people are suggesting that taxes should be increased to provide more funding. In the future, when the economy recovers, the County will again be in a position to fund the BOE in excess of the MOE level. But the voters must realize that any time the County provides funding that exceeds the prior MOE level, then this increases the County’s MOE requirement by that amount for all future years. And the MOE law further provides substantial monetary penalties if the County does not meet its MOE level. The combination of these requirements makes all counties very cautious in their budgeting of MOE. This BOCC has been cautious with MOE funding, but we have advanced funding for BOE capital improvement projects during all four of our budgets. This has enabled us to build the new North Frederick Elementary School a year early. 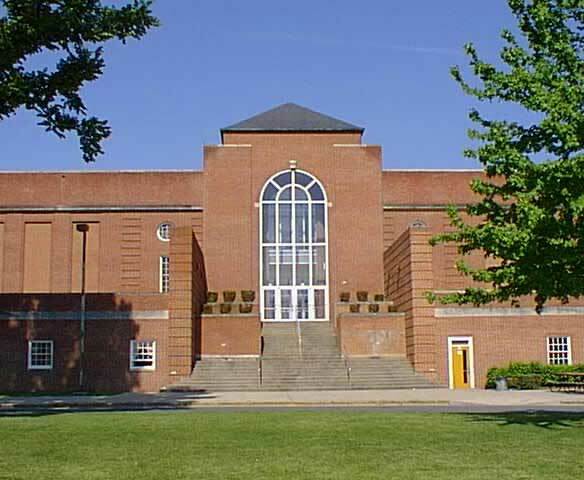 We have also moved up the Urbana Elementary School renovation and the Frederick High School rebuild. One time CIP funding clearly helps improve the quality of education we offer—no one disputes this. Parents, children and teachers at North Frederick Elementary School are enthused about the new building they will have this coming fall. This one time finding enhances the quality of education without increasing the MOE level. Frederick County is not falling behind other counties in the State by funding education at the MOE level. The BOCC’s funding of education in Frederick County continues to keep Frederick County as one of the best school systems in the state, and one of the most attractive counties in which to work for teachers and administrators. C. Salaries of BOE Employees vs. Salaries of Other County Employees. Some have complained that it is unfair for County employees to get a higher pay increase than that of the teachers. Those who are aware of the salary histories of BOE employees versus other County employees know that during the past twelve years BOE salary increases have far outpaced the salary increases of other County employees. As shown in the attached chart (Exhibit 4), BOE salary increases have been more than 10% higher for BOE employees than for County employees. For example, for a FCPS teacher and a County employee both making $50,000/year in 2002, in 2013 the teacher would be making $80,451 while the County employee would be making only $74,374—a difference of over $6,000/year in favor of the teacher. BOE employees should understand that the other County employees are very much aware of the better salary treatment that BOE employees have historically received. Salary increases for BOE employees exceeded the increases for FCG employees in nine years from FY2003 – FY2009 and FY2012 & FY2013; neither had pay increases in FY2010 and FY2011. In FY2014 BOE employees received pay increases of 3.5% and FCG employees received pay increases of 4.5%. The FY2015 budget gave County employees a 5.5% pay increase for their excellent work, after the BOCC reduced the size of the County workforce by 23.8%. The BOCC learned on the day we passed the budget that the BOE gave its employees a 1.1% increase. But the BOCC does not control the number of BOE employees nor their salaries. Despite the recent adjustment that was greater for FCG employees than for BOE employees, BOE salary increases have far out-paced FCG salary increases. (1) Maryland Department of Education, The Fact Book 2012-2013, at page 21. We do not yet have the information for the 2013-2014 school year.